1. Purchase of Farm Rescue raffle ticket indicates you agree to abide by the following terms, rules and conditions. 2. Need not be present to win. 3. Prize is not transferable prior to taking legal possession as owner. 4. Must be 18 years of age to win John Deere D105 riding lawn mower. 5. Raffle ticket purchasers and winners must reside within the 48 contiguous United States, Alaska or Hawaii. 6. Winner(s) must take delivery of prize within 30 days of notification of winning raffle ticket or prize will be forfeited. 7. Winner(s) will be responsible for all optional equipment, title, license, insurance, registration fees and applicable taxes in receipt and use of prizes. 8. Winner of the John Deere riding lawn mower is responsible to make all arrangements and costs associated with transport of item to requested delivery address. 9. HI Trip incl. round-trip airfare for 2 from contiguous US and hotel accommodations only. Cruise incl. round-trip airfare from contiguous US to Ft. Lauderdale, FL or Miami, FL and cruise fare for 4-night oceanview stateroom only. 10. Raffle winners will be required to sign and return an Affidavit of Eligibility and Liability/Public Release, present valid identification issued by the winner’s state and complete a W9 no later than ten days following its receipt or prize will be forfeited and an alternate winner selected. Return of any prize notification will result in forfeiture of prize. 11. Winners will be notified by email and USPS first class mail to address listed on raffle ticket receipt when purchased. Farm Rescue is not responsible for updating email or mailing addresses of contestants. 12. 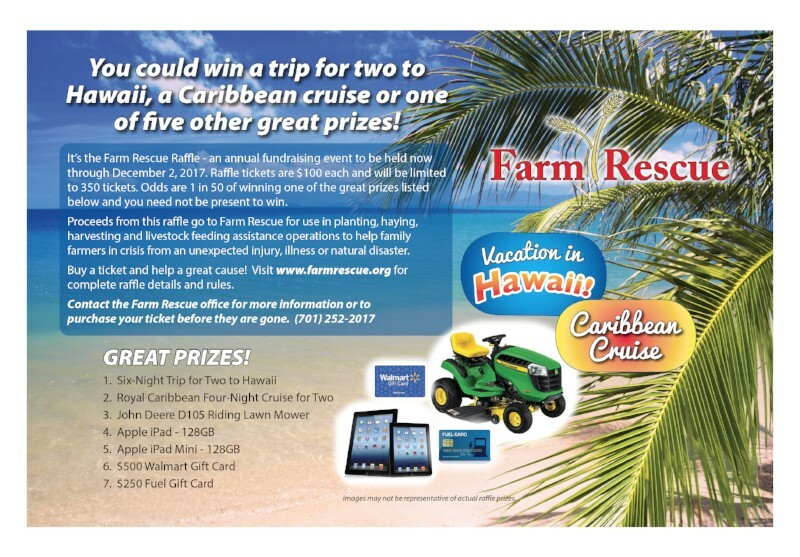 Voluntary purchase of raffle ticket indicates that participants consent to use of name, photograph and/or likeness for advertising and promotional purposes in connection with this raffle drawing by Farm Rescue and its employees, board of directors, volunteers, sponsors, contractors, supporters and donors. 13. All participants agree to hold harmless and release Farm Rescue and its employees, volunteers, board of directors, sponsors, contractors, donors and supporters; associated and all others associated with the Farm Rescue Raffle contest and drawing from all existing or future alleged or actual claims, actions, and liabilities with respect to or in any way arising from this drawing; acceptance, possession, use, or misuse of a prize, including, but not limited to, liability for personal injury (including wrongful death or disability), damage to property, and damage or loss of any other kind. 14. Subject to federal, state and local laws and regulations. Void where prohibited or restricted by law.